French Trade Minister Anne-marie Idrac (2nd from left) in press conference in a Seoul hotel on Oct. 9, 2009. At 2nd from right is French Ambassador to Seoul Elisabeth Laurin. "The main achievement of my trip to South Korea is to secure the common vision regarding the free trade agreement (FTA) between South Korean and EU," said a top French trade official in a recent press conference in Seoul. French Minister of State for Foreign Trade Anne-marie Idrac said that her visit to Korea was aimed at boosting the bilateral economic ties between South Korea and France. The press conference was held at Grand Ambassador Hotel in Seoul's Jangchung-dong area on Oct. 9, 2009. Minister Idrac has visited South Korea from Oct. 9 to Oct. 11, 2009. This was her second visit to the nation. She visited Seoul several months ago. She was accompanied by three officials of the France regional chambers of commerce. 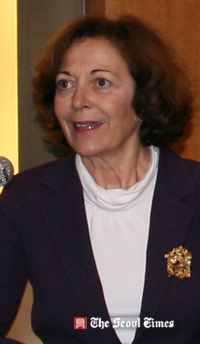 Ms. Anne-Marie Idrac is the current French Minister of State for foreign trade. She said that she brought them to Seoul in her efforts to find out the supporting policies of South Korea for the regional French businesses. During the conference Minister Adrac praised South Korea for successfully overcoming the financial crisis which hit much parts of the world. She also pledged Franch government's support for the free trade agreement which was at the last stage of successful conclusion. "There will be a new step forward for the promotion of regional trade if the FTA is concluded successfully," she said. She said that the accessability to the each other's market would be enhanced and traffs would be greatly reduced. Minister Adrac showed her respect for the "Greeen Growth" policy of South Korea. She said that France on its part is exerting huge efforts to reduce green house gas. She said that borth France and South Korea could take the common stance at the "Copenhagen Climate Change Conference 2009" which is slated for Dec. 6-18, 2009 in the Danish capital. The minister was also very pleased that South Korea will host the 5th Group of 20 Summit in November 2010. G20 is a group of finance ministers and central bank governors from 20 world's major economies. The 5th G20 will be the largest summit meeting South Korea has ever hosted. And South Korea will be the first newly developed nation to host G20. While in South Korea Minister Adrac met with many local government officials and business leaders. Among them were South Korean counterpart, Trade Minister Kim Jong-Hoon, and Chairman SaKong Il of Korean International Trade Association (KITA). She also visited a "Danone Korea" factory in Muju, North Jeolla Province. Minister Adrac also attended the "French Night" film event of the Pusan Initernational Film Festival before she left South Korea on Oct. 11, 2009.